Xiaomi CEO Lei Jun had shared glimpses of the retail box for the Mi Max 3 ten days ago. The specifications of the device have already been uncovered after it was listed on Chinese certification site TENAA. Xiaomi Mi Max 3 has been in the spotlight for some time now. When the Chinese tech giant said that it had a big announcement to make today, it was assumed that it would be about the new iteration of Xiaomi's phablet. Keeping in line with the expectations, Xiaomi has confirmed that it will be launching the Mi Max 3 on July 19. A poster shared by the company on its Weibo account claims that the Xiaomi Mi Max 3 will come with larger screen and bigger battery. 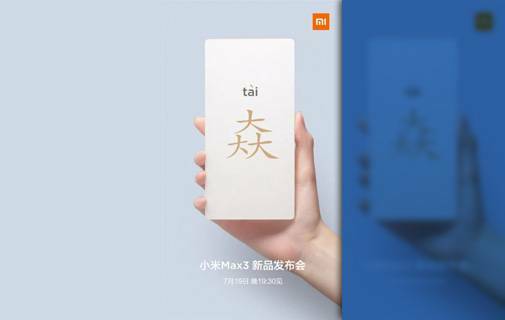 Xiaomi CEO Lei Jun had shared glimpses of the retail box for the Mi Max 3 ten days ago. The specifications of the device have already been uncovered after it was listed on Chinese certification site TENAA. The Mi Max 3 will be powered by an octa-core CPU clocked at 1.8GHz. The exact chipset that will be used has not been divulged yet, though. The Snapdragon 636 or the recently unveiled Snapdragon 632 might make an appearance with the Mi Max 3. The device will be available in three memory options - 3GB, 4GB or 6GB of RAM - with 32GB, 64GB or 128GB storage options. The smartphone could be packing a massive 5,500 mAh battery with support for fast charging. The display on Mi Max 3 is expected to be a 6.99-inch panel with FullHD+ resolution. While the renders so far have not shown a notch at the top, the phablet is likely to come with slim bezels. The fingerprint sensor has been placed at the back, along with a vertically stacked dual camera setup at the top left corner. In the optics department, the Mi Max 3 sports a 12MP Sony INX363 sensor at the back with a 5MP secondary sensor, similar to what has been seen on mid-range offerings by Xiaomi recently. The front camera is expected to be an 8MP shooter. Renders have shown that the Mi Max 3 will come with a USB Type-C port along with the 3.5mm audio jack. The IR blaster commonly found on Xiaomi phones and used for remote controlling appliances via Mi Remote will also be seen on the Mi Max 3. A Mi Max 3 Pro with Snapdragon 710 chipset, 6GB of RAM and 128GB of storage is also expected to be launched. While this higher-specced variant is still a rumour, the rest of the variants have been confirmed by the TENAA listing. The highest variant with 6GB RAM and 128GB storage is expected to be priced at 1,699 yuan (or $253).